Figure 1: Set evolution starting from a small input set of lamps (left). With the set evolution "fit and diverse", new generations of shapes are not only fit to be lamps but also exhibit significant and potentially inspiring variations. We introduce set evolution as a means for creative 3D shape modeling, where an initial population of 3D models is evolved to produce generations of novel shapes. Part of the evolving set is presented to a user as a shape gallery to offer modeling suggestions. User preferences define the fitness for the evolution so that over time, the shape population will mainly consist of individuals with good fitness. However, to inspire the user's creativity, we must also keep the evolving set diverse. Hence the evolution is "fit and diverse", drawing motivation from evolution theory. We introduce a novel part crossover operator which works at the finer-level part structures of the shapes, leading to significant variations and thus increased diversity in the evolved shape structures. Diversity is also achieved by explicitly compromising the fitness scores on a portion of the evolving population. We demonstrate the effectiveness of set evolution on man-made shapes. We show that selecting only models with high fitness leads to an elite population with low diversity. By keeping the population fit and diverse, the evolution can generate inspiring, and sometimes unexpected, shapes. Figure 3: Color-coded visualization of fuzzy part correspondence (red color: larger FPC value; yellow: small). Figure 4: Part crossover (left) and part mutation (right) based on component-wise controllers. 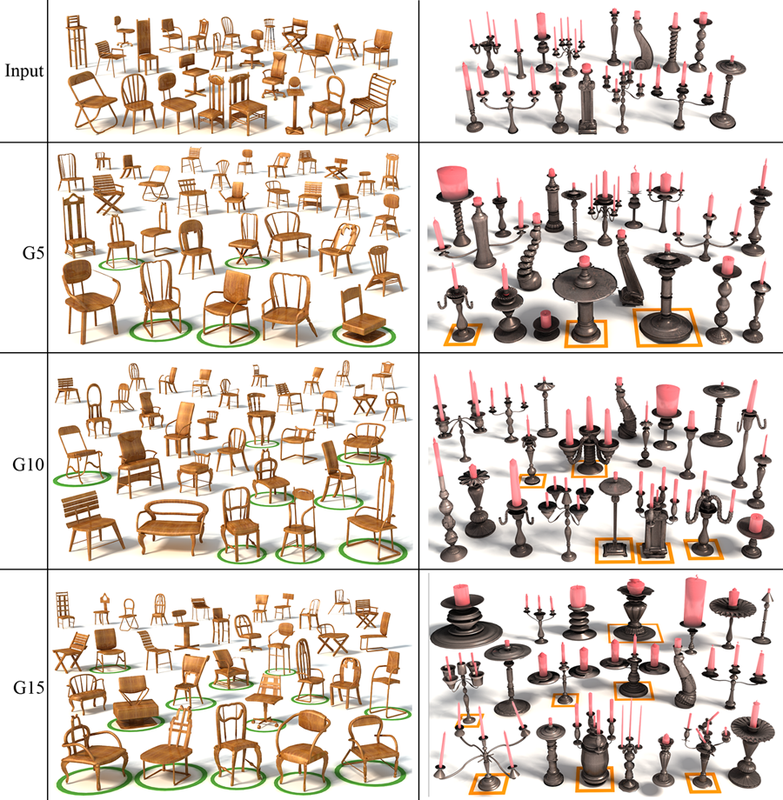 Figure 5: Evolutions of a chair set (left) and a candelabrum set (right). The entire input sets are shown. We show randomly selected shapes from the gallery in three generations. Shapes marked are those identified as unexpected/interesting by the participants. Figure 6: Elite sets generated due to a lack of diversity control. (Left) Preferences given to heart- or diamond-shaped bottles. (Right) Preferences given to cat-like creatures. We would first like to thank the anonymous reviewers for their valuable feedback. Thanks also go to Chao Lai and Shuai Lin from NUDT for their help with making the video and to the artists from SIAT, especially Jiacheng Ren and Qifeng Wei, for the modeling and rendering efforts. This work is supported in part by grants from NSFC (61161160567, 61025012), National 863 Program (2011AA010503), Shenzhen Science and Innovation Program (CXB201104220029A, JC201005270329A), NSERC (No. 611370), and the Israel Science Foundation.